One of our clients came to us wanting to keep her Sugar House bungalow looking like a bungalow, but with twice the livable space. Without destroying the classic style or eating into her flower gardens, we designed a major renovation by excavating the basement. The floor of the unfinished basement was lowered to increase the 6-foot ceilings to comfortable 8-foot ceilings. If you think this sounds expensive, you are right. It runs about $30 to $40 per square foot, but it is well worth it in some cases. It was the perfect option for this bungalow. 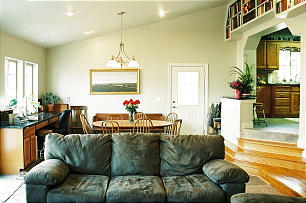 The owner, Ann, could keep the look of her bungalow built for two but have the room for many more. A major basement overhaul added more than 1,300 square feet to this Sugar House bungalow. Once you have the plans of everything you want in your home then an architect can help you plan the phases and what to do first. “I know plenty of people who try to do it on their own, but it ends up looking chopped up,” Ann added. While doing the project in one swoop would have been faster and possibly cheaper, this project actually lent itself nicely to phasing. We divided the project into three phases. Naturally, we moved the laundry room upstairs to create main-floor living. We designed a stair tower that is 10-inches wider and 4-feet longer than the original staircase. In Phase 2, we finished the basement, creating a large gathering place for guests and family when they come to visit. The basement now has two bedrooms, a large family room, a bathroom, an office, a mechanical room and storage space. Phase 3 was largely creating a more spacious master suite from the two original bedrooms on the main level. “I love my bedroom,” Ann said. “My favorite part is my deep, soaking tub.” We also designed a beautiful walk-in closet for the master suite. The bedroom’s new oak flooring matches the classic wooden style of the rest of the house. We managed to keep the 1920s bungalow still looking like a bungalow. Only now it feels brand new and has more than 1,300 more square feet of living space downstairs. Ann’s only complaint is that her property tax bracket went up with the square footage, but you know what they say about death and taxes! As always, we welcome your home architect design questions at ask@renovationdesigngroup.com.